History and Legend of the "Flor de Nochebuena"
The Poinsettia (Euphorbia pulcherrima) has become a symbol for Christmas around the world. Its bright red color and star shape reminds us of the holiday season and cheers up a cold winter landscape. You probably associate this plant with the winter season, but in fact it grows best in a hot, dry climate. It is native to Mexico where it is commonly known as the Flor de Nochebuena. In Mexico, you may see them as potted plants, but you'll also see them widespread as decorative plants in people's yards, and they grow as perennial shrubs or small trees. The Poinsettia grows at its best in Guerrero and Oaxaca states, where it can reach up to 16 feet in height. What we think of as flowers on the Poinsettia plant are actually modified leaves called bracts. The actual flower is the tiny yellow part in the center of the colorful bracts. Perhaps the best known of Mexican plants, the Nochebuena blooms mainly in November and December. The bright red color is ubiquitous and at the beginning of winter, the bright color is a natural reminder of the approaching holiday season. The name of the plant in Mexico, "Nochebuena" literally means "a good night" in Spanish, but this is also the name that is given to Christmas Eve, so for Mexicans, this is truly the "Christmas Eve flower." The Aztecs were very familiar with this plant and they called it Cuetlaxochitl, which means "flower with leather petals." or "flower that withers." It was believed to represent the new life that warriors attain in battle. The bright red color likely reminded them of blood, which had great significance in the ancient religion. During the colonial period, the friars in Mexico noticed that the green leaves of the plant turn red during the time leading up to Christmas, and the shape of the flower reminded them of a star of David. They began to use the flowers to decorate the churches during the Christmas season. The Poinsettia gets its name in English from the first U.S. Ambassador to Mexico, Joel Poinsett. He saw the plant on a visit to Taxco de Alarcon in Guerrero state, and was startled by its striking color. He brought the first samples of the plant to his home in South Carolina in the United States in 1828, initially calling it the "Mexican Fire Plant," but the name was changed later to honor the man who had first brought it to the attention of the people of the United States. From that time on the plant became more and more popular, eventually becoming the flower that is most associated with Christmas all over the world. 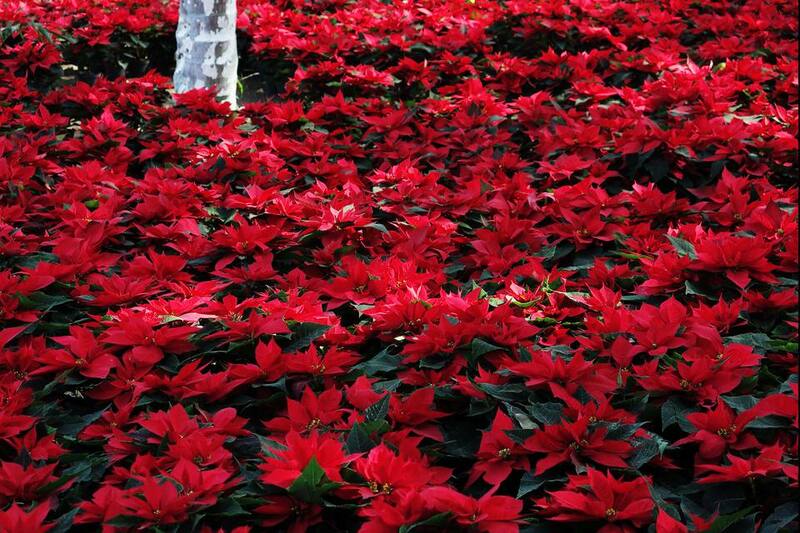 There is a traditional Mexican legend surrounding the Poinsettia. It is said that a poor peasant girl was on her way to attend mass on Christmas Eve. She was very sad because she didn't have a gift to present to the Christ Child. As she was walking to the church, she gathered a few leafy green plants to take with her. When she arrived at the church, she placed the plants she carried underneath the figure of the Christ Child and it was only then that she realized that the leaves she carried had turned from green to bright red, making a much more fitting offering.